How long do the Food Tours last? Where do we end up at the end of the tour? Yes, we cater for most dietary requirements. There is no fish or seafood, very little meat, and almost no dairy on our tour. Inform us in advance, and we can easily cater for vegetarians, lactose intolerance and gluten intolerance. P.S. Please tell us about any allergies! Our Food Tours are very sociable tours where we spend a lot of time sitting around, discussing and enjoying the food (and the wine!). As such, they may not be that enjoyable for the younger children (under 12). Why not consider our Bike Tours instead, as they're perfect for all ages?! In case of light rain, we just carry on eating our way across Nice. In case of an absolute deluge, we will cancel the tour and give you a full refund. 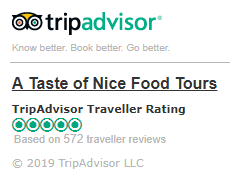 How long does the Food Tour last? The Food Tour lasts around 4 hours. Where do we end up at the end of the Food Tour? The Food Tour ends in the old town of Nice. If required, we can point you or walk you back to the waterfront to aid your sense of direction! As the Food Tour involves some walking (about 2 km/1.2 miles in total), it is better to wear comfortable shoes and clothes. Nothing - we take care of everything! The tour covers about 2 km/1.2 miles of easy, flat walking in a leisurely pace.